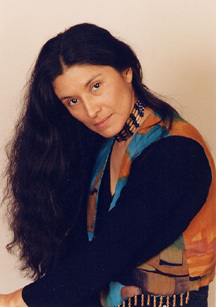 Valerie Dee Naranjo is from Southern Colorado. She began her musical studies as a child singing in her family tradition. Her love of gyil began at age 18 when she learned of the instrument and was rekindled at age 22 when she first heard a recording of the late Kakraba Lobi, founding gyil master of The Ghana Dance Ensemble. Kakraba mentored Valerie for 17 years whence they appeared on international CNN from the University of Ghana’s International Center for African Music and Dance. Kakraba and Valerie collaborated to produce the series “West African Music for the Marimba Soloist” so that players of the American Marimba could better their understanding if its West African history and parentage. More recently Valerie has produced “Joro” a series of works for gyil soloist and orchestra; and “Pure Earth” concerti for gyil, marimba, and wind ensemble. In 1988 Valerie affected a decree from the Lawra Council of Elders and Chief Abiefa Karbo, that their ban on women playing gyil in public be lifted so that she could participate in the annual Kobine Festival of Traditional Performing Arts. 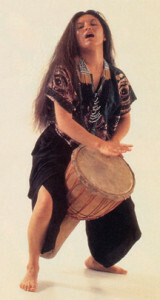 She and Barry Olsen were honored, in 1996, with the only first place award at the Kobine Festival ever given to non-West African musicians to date. RG productions’ film “Knock on Wood” documents this activity, and has appeared in film festivals from Woodstock to Kathmandu. 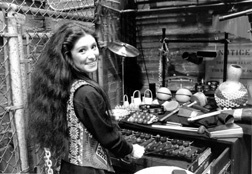 Valerie has been the percussionist for the NBC Saturday Night Live Band for 23 years, performing with such artists as Paul Simon, Lady Gaga, and Mick Jagger. Otherwise she has performed with such American artists as Carole King, Glen Velez, David Byrne, Philip Glass, and Paul Winter; Thuli Dumakude, Tu Nokwe, and Zim Nqawana (South Africa); The National Symphony, Kakraba Lobi, Ba-ere Yotere, and the late Bernard Woma (Ghana); Airto Moriera and Jose Neto (Brazil); and Zakir Hussein and Srinivas Krishnan (India). Drum! magazine reader’s poll named Valerie “World Music Percussionist of the Year” 2005 and 2008, and “Mallet Player of the Year” 2012. 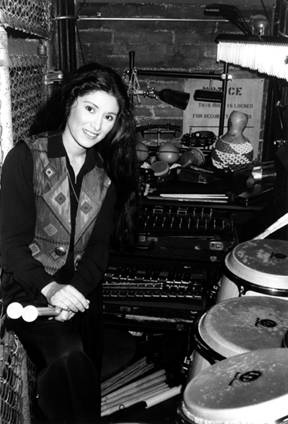 Valerie has recorded the CD “Mandara”; several CDs of gyil music with Kakraba Lobi and Barry; the CD “Zie Mwea” with Barry and Bernard Woma; a solo indigenous American music CD “Orenda”; Lewaa’s Dream (for gyil, marimba and percussion ensemble); and “Batagyil” with the percussion trio Africa->West. Valerie is the professor of West African percussion, song, and dance at New York University’s Steinhardt School, and is a member of NYU’s “Global Institute of Advanced Studies” which helps professors to an improved international understanding. She has performed and taught as a guest artist internationally, including nine African countries, and in such situations and locations as The 2010 Winter Olympics in Vancouver; The White House and The Kennedy Center in Washington D.C.; New York’s Lincoln Center, City Center, and Carnegie Hall; London’s Royal Festival Hall; The Johannesburg Civic Theatre; The National Theater of Ghana; Ten featured appearances at annual Percussive Arts Society International Conferences; two appearances at The International Festival of the Marimba (Chiapas, Mexico); The Vancouver Jazz Festival; The Kaisuka Festival (Japan); The Grahamstown and Arts Alive Festivals (South Africa); Scotland’s Edinburgh Festival, “Young Indians” (New Delhi); FESTIBO (Bouna, Cote D’Iviore); and television’s “Jay Leno Show”. Valerie is committed to the value of the arts toward mutual understanding of and for all people.